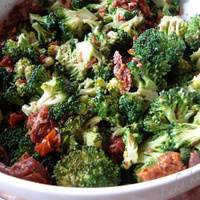 Remove the broccoli florets and cut them up into smaller ones. Finely slice the green stalks, discard the thick dry base. Blanch the broccoli florets in boiling water for 1-2 minutes, long enough to soften the broccoli but still leave it al dente OR in very little water in a microwave oven for 2-4 minutes on MAX (check after 2 minutes for crispness). Drain it in a colander and leave to dry or wrap in a paper towel to dry (this is important because it will help the dressing cling to the broccoli). Fry the bacon in olive oil on a medium heat until until crisp and golden. Remove from the pan with a slotted spoon onto the paper towel, wrap and crumble it by gentle pressure. Use the leftover fat in the pan for the salad dressing(about 2 tablespoons). Whisk all the dressing ingredients with and 2 tablespoons of the leftover fat in a mixing bowl. Add the sliced dry tomatoes. 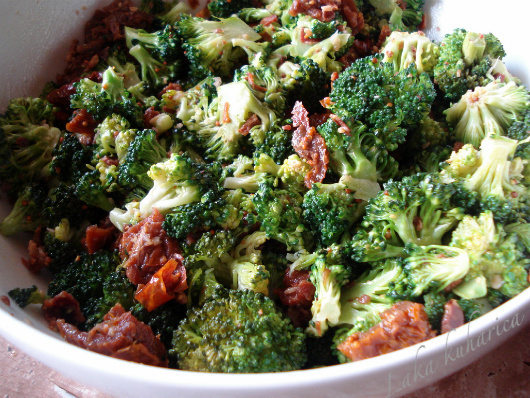 Place the broccoli in a salad bowl, add the dressing, sprinkle with crushed crispy bacon, season with salt and pepper. Toss thoroughly so the broccoli is evenly covered with the dressing. Serve on its own or with grilled or roasted meat or fish.